One of my very favorite desserts to make is my Nana's pound cake. The recipe is one of those passed down in the handwriting of my beloved grandmother on a yellowing page of her cook book. This book is one of the most treasured possessions I own; although she has been gone for many years now, every time I make her pound cake, I feel her in the kitchen next to me. Nothing is more quintessential MSC than a recipe such as this; however, to be truly MSC, there has to be a twist. In celebration of the autumn season here in the South, the recipe calls for pumpkin and spice. The following recipe, although reluctant to give, is my grandmother's deliciously light and moist pound cake with a fall twist. I hope it brings as much joy to your family as it brings to me every time I make it. I love you Nana Handy! 1. Spray your bundt pan with non-cooking spray with flour. I prefer to use the floured spray rather than the shortening and flour technique because of the intricate detail of my bundt pan. I tend to have better luck with a clean release. However, it is key to be liberal with your coating, no matter which technique you choose. The last thing you want is a delicious cake held captive in a sticky pan! 2. Cream the butter, shortening and sugar in a stand mixer. Allow the mixture to become fluffy. This step is very important for setting up the texture of the cake. 3. Add the 5 eggs, one at a time, incorporating well after each addition. Scrape the sides of the bowl periodically. 4. 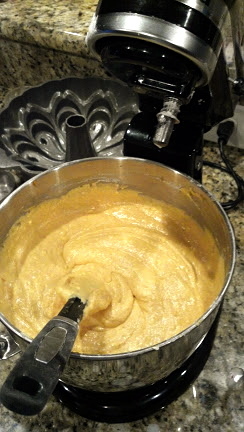 Add the pure pumpkin puree and vanilla to the mixer; mix well. 5. In a separate bowl, combine the dry ingredients. 5. Beginning with one-third of the dry ingredients, alternate dry ingredients and milk, allowing each step to become incorporated before alternating. You will do three alternating cycles, ending with the milk. 6. Pour into the prepared bundt pan. I place the pan onto a cookie sheet before placing in the oven just to catch any possible overflow. I would much rather clean a cookie sheet rather than the entire oven bottom! 7. The cooking time will depend on the size of your pan and your oven. After 1 hour 15 minutes, check the cake. DO NOT stick it with a tester; you will have a fallen cake if you do! Begin watching the cake every 15 minutes until the top is firm to the touch and there is no jiggling motion to the cake. If you test the cake at this point, you might still get some moist crumbs attach to the tester, but there should be no batter. My cake takes 2 hours to bake. 8. Remove the cake from the oven and allow to cool for 15 minutes in the pan. 9. Invert the cake onto your serving dish. 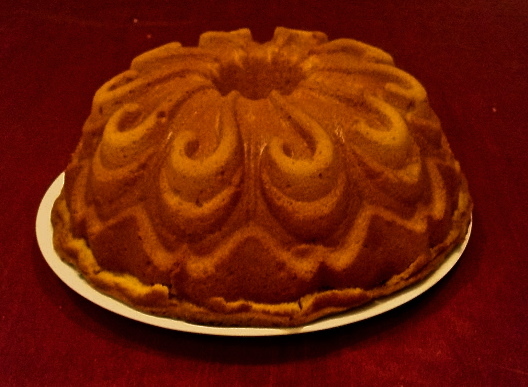 If you coated the pan well, the cake will release with no problem and you will be left with a steaming, beautiful cake. 10. I like to serve with whipped cream and a dusting of cinnamon. 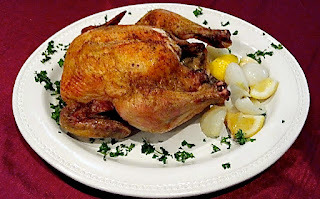 There is nothing more traditional than having roasted chicken on a Sunday afternoon. The key to a good chicken is moist meat and crisp skin; today's recipe delivers on both! By stuffing the cavity with aromatics, the meat becomes infused with flavor and retains its natural moisture; rubbing the skin with butter allows for browning and crisping. Which when did butter ever hurt anything, really? 1. Preheat oven to 350 degrees (F). 2. 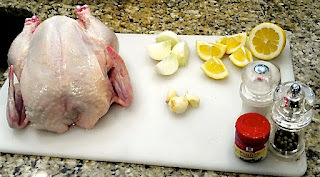 Remove the internal organs and neck from the cavity of the chicken. Thoroughly rinse with cold water and then pat dry with paper towels. 3. Place the chicken breast side up in a large roasting pan atop a rack. The rack will prevent the bottom from sticking and burning as well as ensure air circulation around the bird for even cooking. I also like to ben the wing tips around to tuck under the legs; this makes a nicer presentation and also prevents the tips from burning. 4. Place the onion, lemon and garlic into the cavity of the bird. I like to alternate the ingredients to make sure they are spread throughout; this might not really be necessary, but I just like to evenly distribute. 5. Using your index finger, create a small hole between the skin and the breast meat from the bottom of the chicken. Making small side-to-side motions, create a pocket. Take 1/2 Tablespoon of butter and rub under the skin of each breast. Use the remaining Tablespoon of butter to coat the exterior of the chicken. 6. Sprinkle the skin with salt, pepper, and poultry seasoning. Make sure to evenly coat over the entire skin. 7. Loosely tent with aluminum foil and place in a preheated oven. Cook for 2 hours. After 2 hours, remove the aluminum foil and allow to brown for an additional hour. If the skin starts to become too dark, re-tent with foil and continue to cook. Total cooking time will be 3 hours. 8. Remove from the oven and allow to stand at room temperature, tented with foil, for 15 minutes. 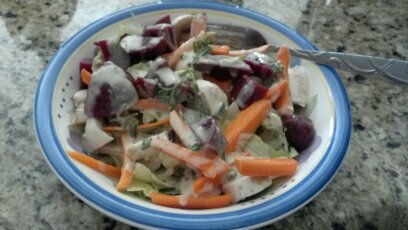 So there is a local pizza house that I love to frequent, but not for the reason you may think; yes, their pizza is wonderful, but more than anything, I love to get their salad with house dressing. What makes the dressing so wonderful, you ask? Well, it is the perfect blend of tang, garlic, and creaminess to satisfy my taste. I am even guilty of using the dressing to dip my pizza into! Yes; sinful. However, delicious! I have searched high and low for the dressing, but the restaurant does not sell it and nothing from the store tastes exactly right. 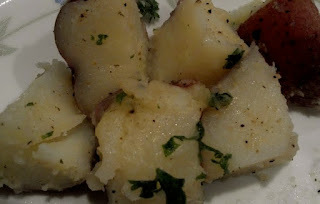 So I decided to do what any modern cook would do....I researched tons of recipes and then devised my own. I hope you enjoy my "Heavenly Dressing." 1. In a food processor, combine all ingredients except oil and parsley. Run the processor for 30 seconds until well combined and homogeneous. 2. Slowly stream in the oil through the feed tube with the processor running on low. Be careful to pour slowly in order to get a smooth and creamy consistency. 3. Chop the parsley and add to the processor. Pulse a couple times to combine. You want visible chunks of parsley in the final product. 4. Serve over the salad of your choice. 5. 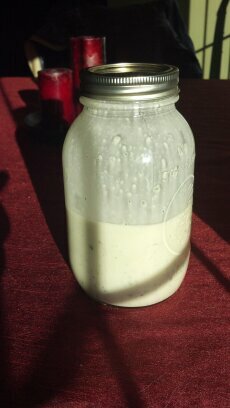 Store extra in a mason jar inside the refrigerator and shake before use. I haven't tried it yet, but I think this could also be a nice marinade! If you have ever read my bio on the page, you know that I love to incorporate different flavors from various cuisines into my everyday cooking. Tonight I looked to Mexican flavors to provide a PUNCH of flavor and intensity to an ordinary cut of meat. 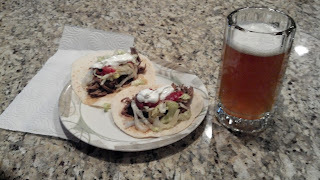 What resulted was a tender, flavorful, and, yes, spicy shredded beef perfectly balanced by the creamy toppings. I will say that this can also be used for non-wrap meals; my husband does not like Mexican food so he used his for a spicy beef sandwich. This meal takes at least 3 hours to make; if you have longer, just let it go on low even longer and it will become even more tender. This is spicy but in a good way, however, young children might find it too hot for their pallets. 1. Place the meat, onions, and garlic in a large dutch oven; I use the Rachel Ray 4-Qt Round Dutch Oven. Pour the can of chipotles over the meat and allow to remain on top. Using the same can, fill with water and pour into the pot. Fill and pour twice for a total of 14 ounces. This allows all of the spices to be used instead of thrown away; no point in wasting the spice blend you have purchased! Sprinkle with salt. Add Worcestershire and Vinegar to base of pan and stir slightly to combine. 2. Cover the pot with lid and place in preheated 275 degree oven. Allow to cook at least 2 hours. 3. One hour before serving crank the heat up to 350 degrees. After 45 minutes check for fork tenderness and flaking. If the meat does not pull easy, cover and place back in the oven. 4. When the meat is fork tender, remove and allow to sit on the stove, covered, for at least 5 minutes. 5. 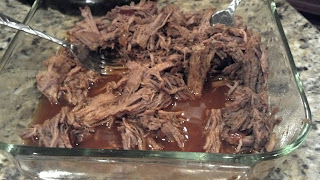 Remove the rested meat from the pot and use two forks to pull/shred. Place the shredded meat in a dish and spoon over the reserved pan juice to moisten the meat. 6. Serve the meat in a rice tortilla and top with your choice of flavors. I highly recommend sour cream or guacamole to balance some of the heat. 7. Store the leftovers in their juices and use for more tortillas or to top salads. Tonight is one of those nights where I come in completely exhausted and struggling to figure out something to make for dinner. Of course I could do the fastfood or pre-made meals, but I really prefer something wholesome. While watching television, I saw meatloaf and thought, "Duh! That would be good." So meatloaf it was! Now, this meal is very simple, but very delicious. Unlike the dry blocks of charred meat some people are used to, this is a moist and healthy alternative. 2. Combine all ingredients except for the bread crumbs and ketchup in a large bowl. Using your hands, thoroughly mix the ingredients. 3. Add 1 cup of bread crumbs and fold into the mixture. If the mixture still seems wet and does not begin to form a ball, add the remaining 1/2 cup. You might even need a little more if your meat or tomatoes are more moist. This is all very dependent on your mixture. Add just enough to form a tight ball. 4. Place the meat mixture in a loaf pan and place in oven. 5. Cook uncovered for 30 minutes. 6. Remove from oven and top with ketchup. 7. Return to oven and cook for another 30 minutes. 8. Allow to set for 5 minutes before serving.